When Rachel from Boston Food Blogs sent out a notification for bloggers who were interested in an exchange with a Blogger from another city, I immediately jumped on board! Yes, my time has been at a premium this last month, and I am trying to keep all my ducks in a row….but a handpicked package from a food blogger in Austin….I couldn’t resist! A couple of weeks later I was email introduced to Laurie, the lady behind The Lonely Gourmet. Laurie writes recipes for single (but not boring) folk. She also bravely rights about recently surviving cancer. A woman this amazing deserved the ultimate pack of Boston born and bred goodies! So I set out on a hunt for items that I think any Boston foodie would be proud to represent them! Here is what I sent…. Developed in 2008 by Founder, Dr. David Paquette, Boston-based Biba is designed to provide all-natural hydration for a healthy lifestyle. Formulated during time away from his dental practice in Hudson, MA, endurance athlete and marathon runner, Dr. Paquette developed Biba’s formula to address dehydration from work, medication, illness as well as athletics. 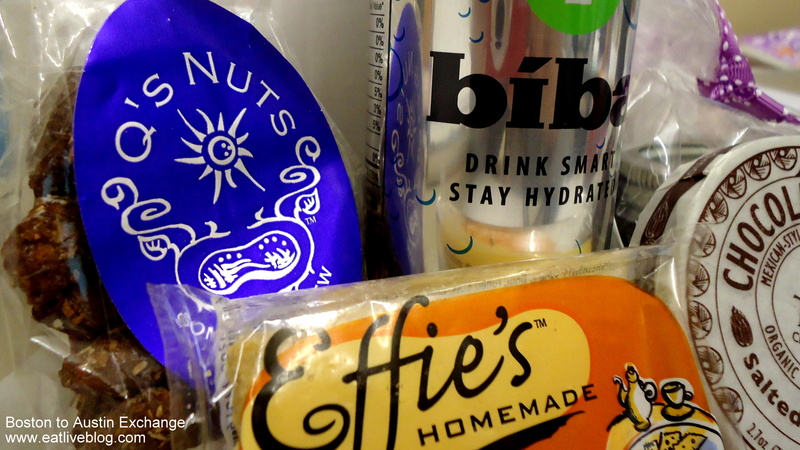 I found Biba when they donated samples for the Boston Brunchers Birthday Brunch gift bags. I think it is amazingly refreshing, and a great substitute when you feel like a soda. As you know, by day I work at Boston University and am obtaining my Master’s Degree in Education there. I just filled out my application for May 2012 graduation! Woohoo! Robin, the owner of Doves and Figs, was one of the first bloggers I connected with in Boston. She is an absolutely amazing person, and a phenomenal cook! So when she launched her jam company last year, it is no surprise that the result was completely addictive. Seriously, you will want to eat this stuff with a spoon! 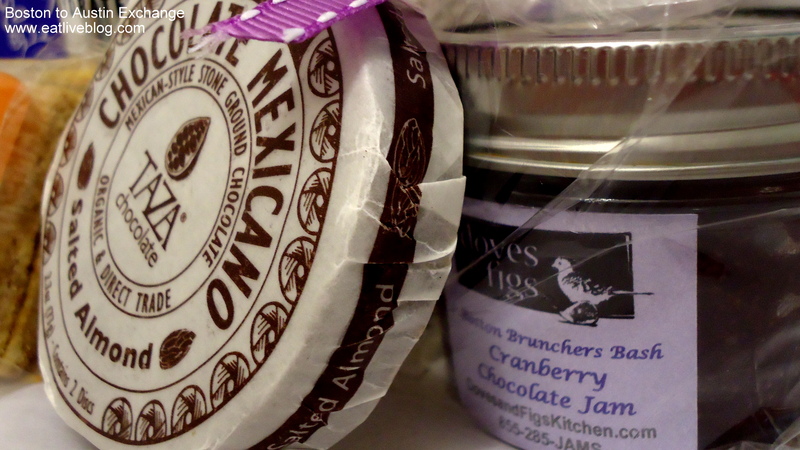 Taza is produced in Somerville in a Mexican tradition. 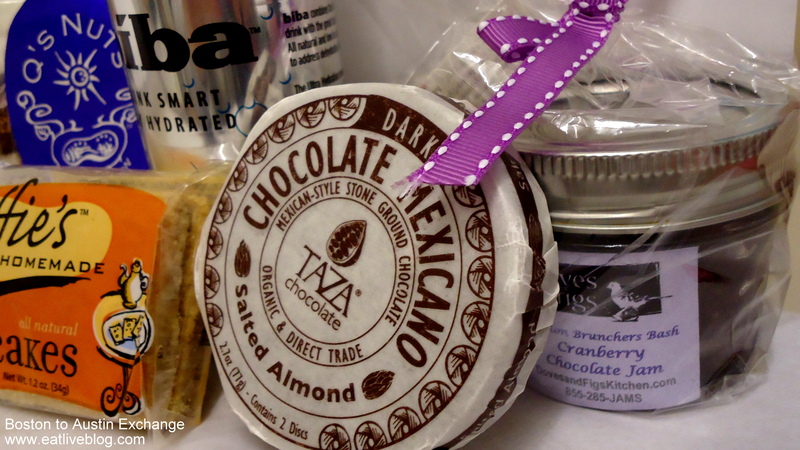 Over the last few years, you could find Taza popping up at Farmers’ Markets and local shops. 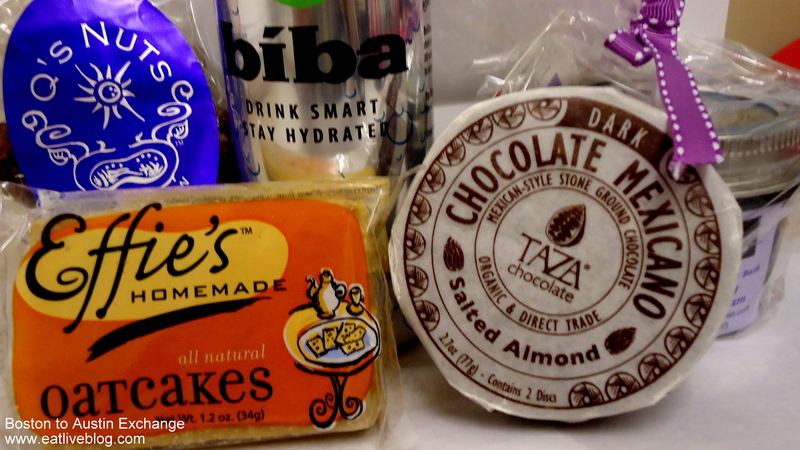 Today Taza is a staple in stores all around Boston, and is very commonly found as a key dessert ingredient at more restaurants than I could name! Q’s Nuts is a small Boston area based, family owned company that roasts their line of sweet, savory and exotic flavors in small batches and packages them immediately, assuring a fresh, quality product. Q’s are found at Farmers’ Markets and local shops throughout Boston. Seriously, the freshness of these creatively flavored nuts really shines through! Based in Hyde Park, MA, Effie’s Homemade was founded by 2 friends around a 4th generation family recipe. The company has been built on the belief that simple, fresh ingredients make everything taste better! A beautiful screen printed landscape of Boston on a greeting card I picked up at a craft fair in Harvard Square this past weekend. It was just too perfect! Yup, the quintessential Boston movie (I couldn’t find The Departed). Although no one may be this crazy about the Sox for a more years (we’re rebuilding), it’s still fun! This holiday magazine from Boston-based America’s Test Kitchen is so much fun! The snickerdoodle recipe is one I will be making for years to come! 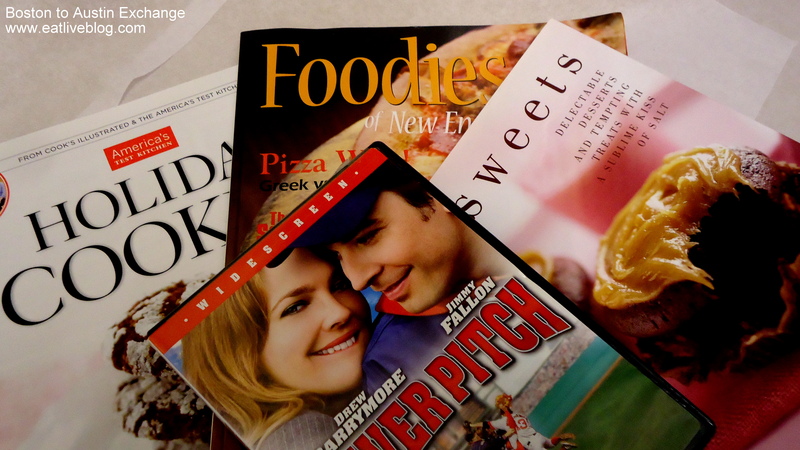 Harvard Common Press publishes cookbooks out of their offices in South Boston. They are a tremendous supporter of the Boston Blogger and Foodie communities. 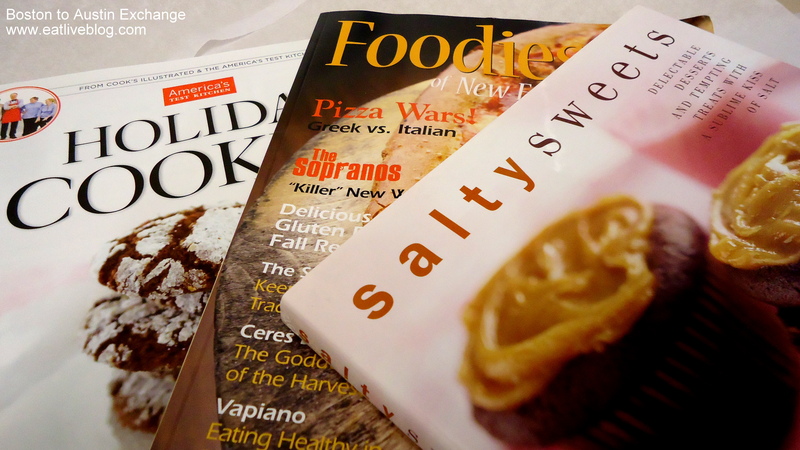 Salty Sweet is the perfect cookbook for the holidays with creative recipes that no one else at your party will have! 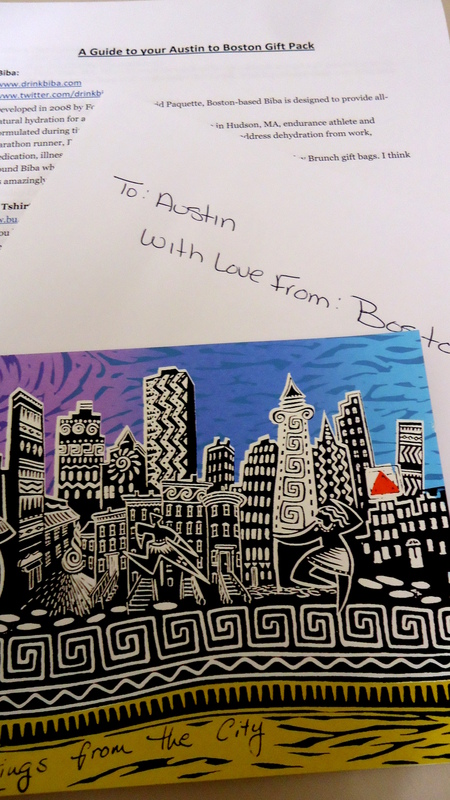 This entry was posted in Reviews and tagged austin, blogger, blogger exchange, boston, local products, recommended by reneeh. Bookmark the permalink. I’m bummed I didn’t get my act together for this, but what a fun idea. Also, great picks! I think you chose a wonderful spread of local offerings. Can’t wait to hear about what you receive in return! I adore Effie’s so I’m happy to see those make the list. I’m definitely a fan. Next year they should include even more cities & bloggers in the mix. I have way too many local products I would have loved to send – Vosges chocolates, Chicago/Evanston spice house spices, Argo Tea tea. 🙁 Oh well. Hopefully it will be back next year. What a great gift swap! You picked some great gifts! What a great bunch of gifts! Laurie is going to be so happy!